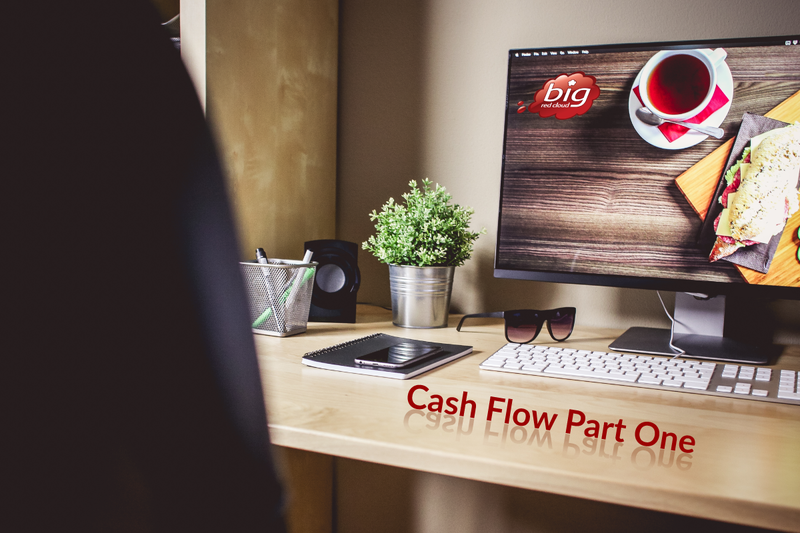 In the First of a 3 part series Michael from Big Red Cloud explains the importance of cash Flow for Startups…. The importance of cash flow is misunderstood by many business owners and managers with the result that many a profitable business actually goes out of business. It’s a hard concept to grasp: if I run a profitable business, how on earth could I go out of business. Read our three part series on cash flow and you’ll get a full understanding of cash flow and realise how profit is no guarantee of survival. It’s no coincidence that they say “revenue is vanity, profit is sanity, but cash is king”. Let’s kick off: What is cash flow? Cash flow is the most important thing that you must look after as a business owner. It is the measure of money flowing in to your business from sales and out of your business due to wages, purchases and expenses. You can either have a positive or negative cash flow. A positive cash flow means you have enough money coming in to cover any outgoing costs whilst a negative cash flow means that the money that is coming into the business doesn’t cover the outgoings. Cash flow can easily be mistaken for profit. It is very easy for a business to actually make a profit but when the final years figures come in, the company may still have a negative cash flow. The reasoning for this is quite straight forward. Cash flow focuses on your business receiving the revenue that is actually owed to you. It is fantastic if you are making sales, but at some point in time, you must receive the money you are owed from customers or clients. Debit and credit cards have become such a popular method of payment over the last few years. However what can be often forgotten in the grand scheme of things is the fact that this form of payment may take a couple of days to process. During this waiting period stock needs to be purchased and wages and overheads may need to be paid. The store’s sales might be good but if there is a delay in receiving the actual money into the business, they won’t have the cash in hand to buy stock or meet their other day-to-day expenses. Remember, cash is king. Top Tip: Always be aware of the fact that your cash flow and profit are separate entities. Be aware of your cash flow situation even if your company is profitable. How does cash flow affect you? A negative cash flow can have an impact on the outlook of your business both in the short and long term periods. As mentioned above the lack of cash in your business can create many issues, most noteworthy, the payment of wages. Not having cash available to pay wages can create huge issues that need to be addressed to get your business back on track. Sadly, some businesses will exist on a hand-to-mouth existence and this is stressful for everyone concerned. Good staff will be hard to retain and staff morale will take a hammering with a resulting decrease in customer care and service. When you are running a business cash flow should be at the forefront of your mind. Profit is great in the eyes of a business but at the end of the day, profit is not cash and as we said already, cash is king. Any decisions made regarding your business finances should take your cash flow situation and cash flow forecast into account, whether positive or negative. A lack of cash can create a lot of issues for your business especially when it comes to your suppliers. At the end of the day if you cannot pay your suppliers you cannot function as a business without their produce or services. A situation such as this with your suppliers can only further compound issues for your business such as a restriction on the products on offer to the customer. This could cause major dissatisfaction amongst your customer base. Your sales will then suffer, causing a compounded cash flow headache down the road as less money is coming into the business. Top Tip: Better business planning should accommodate time for an accounting software solution. It will save you time, make your life easier and most importantly, provide accurate cash flow projections at the click of a button. Check back from Part 2 in our cash flow series as we cover cash flow measurement which, if done correctly, will give you the ability to properly forecast how your business is going to perform and what the cash flow situation will be like. With that information you can then plan for cash flow shortages and be best prepared to overcome any challenges.